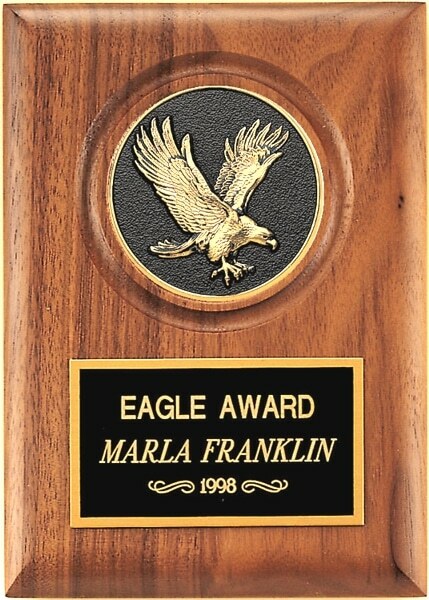 Our P3168 Eagle Medallion Plaque has solid workmanship and it is a very attractive award. This is a walnut plaque with a raised gold eagle emblazoned on a round black plate at the top. The black rectangular engraving plate at the bottom is framed in a thick gold border that makes the gold engraving really pop. This award would of course be perfect to commemorate the attainment of the level of eagle scout or to give as a spirit of the eagle award. However, this plaque would also be well suited for anyone who has the spirit of an eagle, including anyone who soars high and reaches far as the eagle is a well recognized symbol of this. For example, this plaque could be given to anyone who has attained a personal goal such as sobriety, getting a college degree, or successfully completing a mountain climb. The Eagle Medallion Plaque is 5 x 7 inches in size.